SSL Certificates are special data files on a web server that enables secure encrypted online communications. When installed, it enables a secure connection between a browser and a web server thru the HTTPS protocol, it also activates the green padlock on the browser. SSL, which stands for Secure Sockets Layer, is the standard security protocol that establishes an encrypted link between browser and a web server. Using SSL ensures that all data exchanged between the browsers and web server remains private and encrypted. This is done thru cryptographic methods that uses two keys for encryption. This is important because when you send information on the Internet, it is passed from one computer to another computer before it gets to the destination server. Without encryption using an SSL cert, any sensitive information like usernames, passwords and credit card numbers can be seen by any computer between you and the server. Additionally, SSL certificates also provides authentication. This ensures that the information your website visitors are sending is going to the right server and not to someone else trying to steal personal information. Any imposter website could pretend to be yours and trick visitors into sending their personal information to them. To avoid this always get an SSL Cert from a trusted provider. At the point when a website visitor and a web server communicate, normally that data is out in the open and capable of being manipulated or intercepted by an outsider. For clear reasons, this isn't secure. An SSL/TLS Certificate creates a connection thats is encrypted, where all communication between the visitor and server is encoded such that only an authorized party can read it. This secures sensitive information and personal data being shared between the two. As we have specified, a SSL/TLS Certificate serves two purpose. Firstly to encrypt communication between a site and its visitors. The second, authentication, offers verified data about the organization or company that owns the website to its visitors. Trust is significant on the web, and authentication provides your webpage's visitors with the certainty they have to do business with you. The most important component of any business is trust, especially for online business. If the credibility of your business & website, and the security of your customer is paramount, then you’ll need an SSL certificate. It only takes a few seconds for an online customer to establish trust with your company. That is why having a certificate is important, especially an EV certificate or Extended Validation SSL certificates, which plays an important role for a successful website - EV SSL certs are the most recognised symbols of security and trust on the internet. Our certificates price are so cheap because they are purchased in extremely huge quantities, we pass the deep discounts to our customers. Yes! You get the same exact SSL certificates as if you were buying them direct from leading Certificate Authorities like – Symantec, Comodo, RapidSSL, DigiCert, Thawte, Certum and GeoTrust – at a much lower price. Which SSL Cert Is Best For Your Website? If you simply need to secure just one website, we have an extensive range of affordably priced options. Domain Validated SSL certificates or DV SSL are fundamental SSL products which are typically the least expensive in cost. These quick and simple certificates can be issued in just several minutes, as the Certificate Authority (CA) just needs to confirm that the individual getting the certification owns the domain they need to cover. Rather than obtaining and managing multiple SSL certs for multiple websites, you can easily secure each one of your domains with just one Multi-Domain SSL certificate (SAN/UCC). Multi-Domain certificates can cover a number of domains with only a single certificate. Different multi-domain certificates can cover different number of total domains, therefore it varies by product. Our range of Multi-Domain SSL cover anywhere from 1-100 added domain names. Let's say you have a number of sub-domains associated with your site. Maybe a mail server (mail.domain.com) and a store area (store.domain.com), for example. You'll love Wildcard SSL certificates. You no longer need to purchase an SSL for each and every sub domain, one wildcard SSL cert is enough to cover them all. Save cost and make it easy to manage you SSL. Organization Validated certificates, or OV SSL certificates, offers up to 256-bit encryption to sites of registered organisation and businesses. The contrast between OV certificates and domain validated (DV) certificates is that some additional reviewing (vetting) is required to affirm that you own your domain as well as that your organisation is legitimate. Be that as it may, don't worry! As long as your business is registered, the approval procedure isn't an issue. In most cases, it just takes two or three days and you'll be good to go. Look at some of the websites you trust and use regularly (PayPal, DBS, Facebook)... see that green address bar with the company's name displayed in it, that's an Extended Validation SSL certificate, EV SSL. Not only does it encrypts your website, EV SSL certs has been proven to INCREASE TRUST, reduce phishing attacks and even BOOST SALES. For any businesses where the website is an essential part of success, an EV SSL certificate is a MUST! SSL, which stands for Secure Sockets Layer, is a cyber-security protocol that digitally encrypts information sent from a browser to a server. SSL certificates are used to protect sensitive information like credit card numbers, usernames, passwords, email addresses, and more. 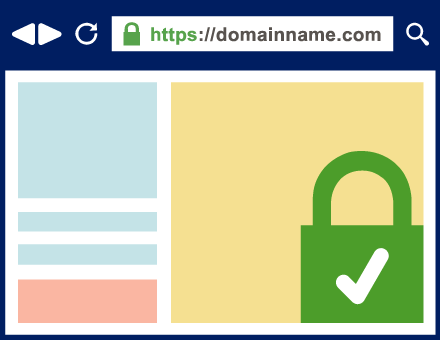 A website with an SSL cert is identified using a number of trust indicators, like "https" and the padlock icon in the browser bar, a site seal from a reputable Certificate Authority (CA), and a green bar that wraps around the URL on more premium certificates. Yes, as long as you have a website, you need an SSL. Google announced, in a blog post, that from July 2018, any website without an SSL will be marked as "Not Secure" on their Google Chrome browser. More than 70% of internet users use Chrome as their browser, so you'll be missing a huge number of visitors if your website is not secured. Are there any requirements to purchase SSL? You need to have a hosted website and a domain name, although a dedicated IP is recommended, it is not necessary. Since many newer web hosting company use SNI (Sever Name Indication) technology, which allows multiple SSL certificates to be installed on one shared IP address. How fast can I get my SSL? Most of the Domain Validated (DV) SSL are issued immediately or within minutes. For Organization Validated (OV) certificates it takes just 2-3 days for validation, approval and issuance. As for Extended Validation SSL certificate it might take up to 10 days, due to the extensive and thorough valicdation process. Can I try an SSL cert before buying? Yes! Of course, we have a RapidSSL 30-day Trial, feel free to contact us for the trial. It's also a good way to test how easy it is to issue and install certificates that are purchased from us, using our user friendly client portal. If you had purchased your SSL from us, simply go to the client portal to renew. If you had purchased certificate from other providers, you can renew thru us as well at a much lower cost. Since in the SSL industry, renewal is basically the same as buying a brand new certificate. The only difference is you get to roll over the remaining time from your expiring certificate to the new "renewal" certificate. In Singapore, so long as you have a business registered with ACRA, you qualify for EV SSL. The main criteria for qualifier for an EV certificate would be that your business is an official company registered with a government authority of a country. If you're a Sole Proprietor or a Partnership registered in the U.K., you cannot qualify for any EV SSL certificate. What should I do to expedite the validation of my EV order? If you need your EV certificate fast, just contact us with your order details. We have connections with the Certificate Authorities (CAs) directly and can help make sure your urgent order is treated with top priority. There are many tools out there to check if the certificate is installed properly, We recommend using Cert Logik's SSL checker tool. The link is: https://certlogik.com/ssl-checker/. Not sure which SSL is best for you? No problem. Send us a ticket with your needs and we’ll get back to you with a recommendation. Free of charge.